GP Amethyst (Mrq), Natural Cambodian Zircon and Kanchanaburi Blue Sapphire Earrings (with Push Back) in Platinum Overlay Sterling Silver 8.750 Ct, Silver wt 9.76 Gms, Number of Gemstone 136. RACHEL GALLEY Sugarloaf Cut Amethyst Earrings (with Clasp Lock) in Rhodium, Rose and Yellow Gold Overlay Sterling Silver 9.300 Ct, Silver wt 7.37 Gms. It's the bling of a stunning jewel to bedazzle your senses. Here to that, amethyst is one impactful gemstone that leaves no stone unturned on striking an influence for the lifetime. The heart stealing purple hues it exhibits is a surreal sight. It is one non-precious gemstone that is adored widely in the UK. The deep purple hued amethyst is most coveted and TJC unleashes some sought after design and styles that pleasantly strike your chords. Coming to the immense beauty that is crafted out of this gemstone it has to be spectacular but amethyst earrings for one has got immense love. Be it the amethyst drop earrings or amethyst stud earrings, they unveil the most elegant mark. On top of that, the dark purple hues complement pretty well with precious metals like gold, silver and platinum making an amalgamation that is all worthy to stun the world. Silver amethyst earrings are all the rage and witness a go-to accessory to spruce up your look. TJC brings into fashion a dazzling indulgence and that been said, amethyst jewellery has to be one a stealer. No matter what, you may complement your look like a boss in amethyst dangles earrings and be a trendsetter. This gemstone has the eyes of the world and certainly, you shall not miss bringing the magic to your closet with some dazzle here and there. 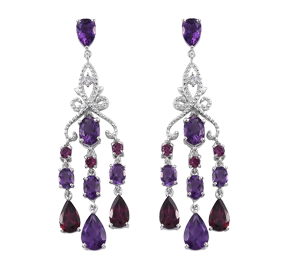 Your baubles should define your personality and have something as stunning as amethyst earrings should be on the head. So, head on to check the most promising amethyst earrings collection from TJC and witness the world of enchantment from your naked eyes.